Step 1 – Let people know that October is Vegetarian Awareness Month and tell them why vegetarians everywhere are celebrating. Step 2 – If you haven’t already, explain why vegetarianism is important to you. Tell them about the benefits of meat-free diets (it may help to have our printed pledge cards which list seven major reasons to choose a vegetarian diet). 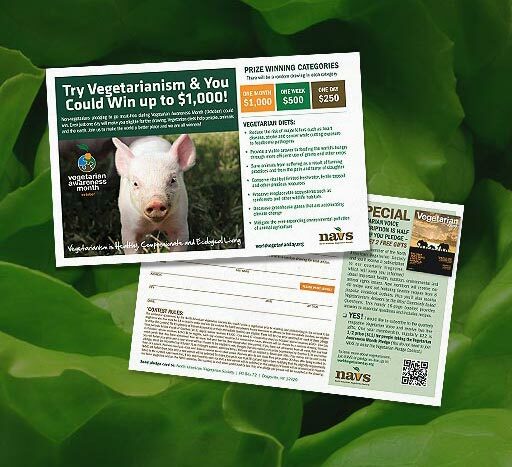 Step 3 – Tell them if they go meat free this October (no meat, fish or fowl) that they could win up to $1,000! Step 4 – Have people fill out the pledge cards and mail them to NAVS. To be entered in the contest, pledge cards must be postmarked no later than October 31, or they can pledge online. Please send me vegetarian pledge cards so that I can encourage friends and family to give vegetarianism a try. Non-vegetarians who pledge to abstain from all meat, fish and fowl will be entered in a random drawing for cash prizes. Due to the high cost of postage, this offer applies only to those living in the United States. Anyone outside of the U.S. can download pledge cards from our website.